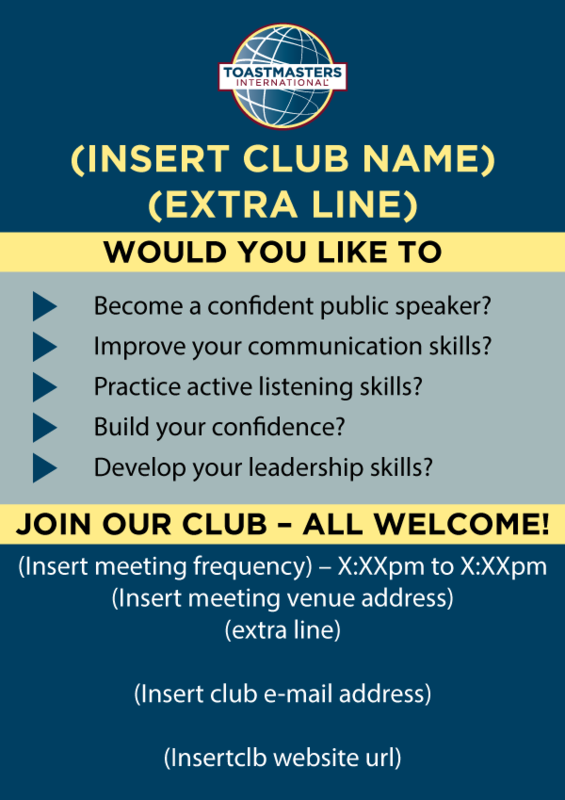 Setting up a New Club? 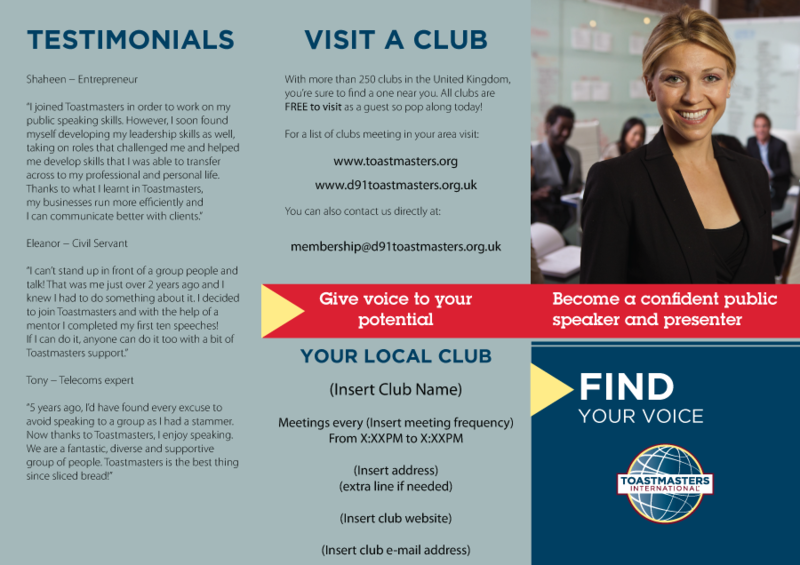 Toastmasters International District 91 has provided Helloprint with a template for double sided business cards, C fold flyers, A4 posters, roll-up banners and 100 cm by 50 cm metal signs that all clubs can use to market and promote themselves. 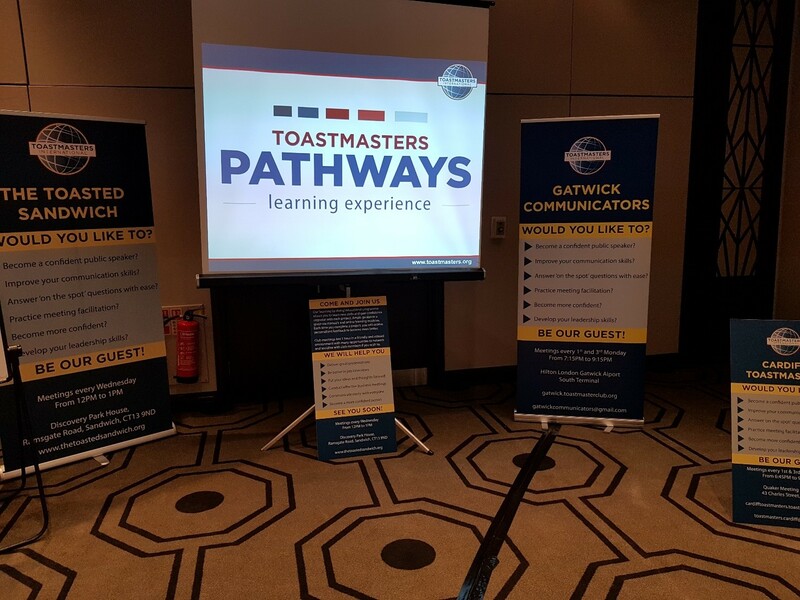 Head to the relevant section (business cards, flyers or folded leaflets, Marketing etc) and select the specifications you require. Recommended specifications for each item are provided below. Pay for the order and make a note of your order reference number. 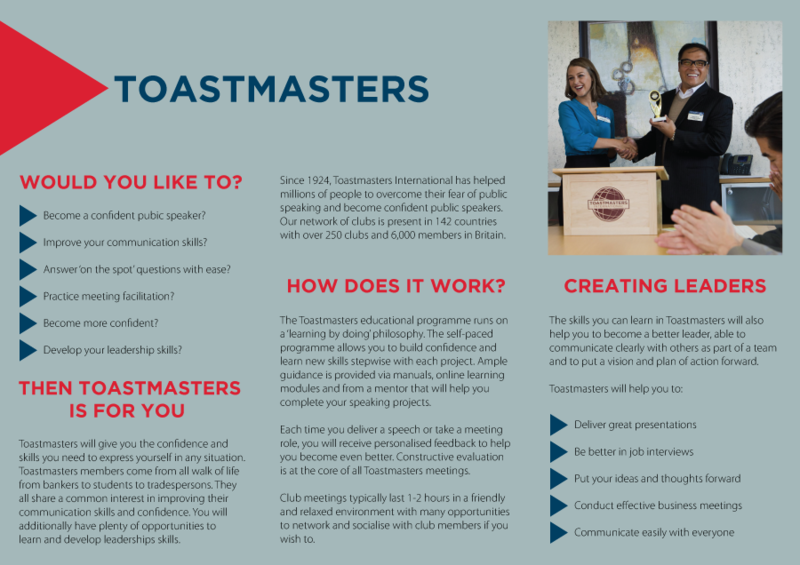 Send an e-mail to hello@helloprint.co.uk with – FAO of Martha Marcus & Your order Number & Toastmasters – in the subject line. 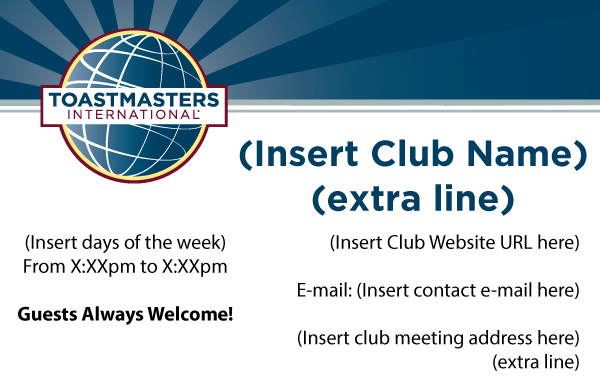 In this e-mail, send all the information to place on the marketing materials ordered (Club name, meeting days, times, contact details and venue address). You’ll be notified when a proof has been created and uploaded to the order. Check the proof to ensure that all information is correct. Once the proof is approved, the order is sent to production. Recommended specifications: Standard size 85 x 55mm; 400gsm Unlaminated OR 400gsm + Gloss Lamination; Double Sided. Recommended order size is 500 OR 1000 units. Recommended specifications: Portrait design, DL size, Gloss Coated 135gsm. Recommended order size is 250 to 1000 units in offset printing. Recommended specifications: Portrait design, A4 size, Gloss Coated 135gsm. Recommended order size is at your discretion. Offset printing is cheaper than digital printing. Recommended specifications: DL size 99 x 210 mm; 250gsm + Gloss Lamination; Double Sided. Recommended order size is 250 to 1000 units in offset printing. The DL flyer template was adapted to fit a 200 cm by 85 cm roller banner and a 100cm by 50 cm sign as well. Single-sided orders are recommended. Several types of roller banners can be ordered: economy, premium or deluxe. Economy banners will cost around £25 a piece, premium and deluxe ones will be around £60. Three main types of signs can be purchased: Foamex, Aluminium and Trespa. Aluminium and Trespa signs are best for outdoor use. Signs will cost between £16 and £25 depending on the material used. Pictures of actual banners and signs can be found below. 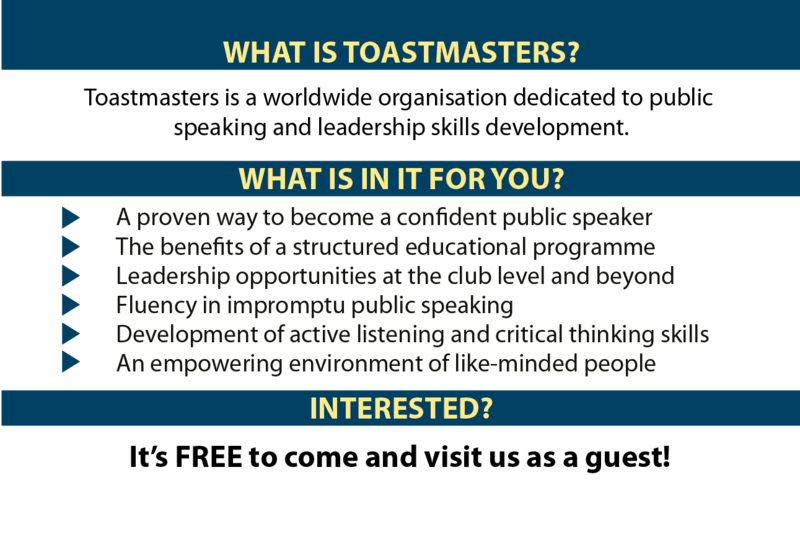 For 2018/19 Distinguished, Select Distinguished or Distinguished awards. Which clubs will achieve this goal in 2018/19?